Two large and welcome arrivals this morning in pallid daffodil colours: the Light Emerald and the Swallowtailed moth. I saw one or the other flitting like a ghost through the twilight when I put the moth trap out just before the ten o'clock news, and here they are dozing on a larch-lap fence nearby. This happens quite a lot: moths not actually entering the trap but settling somewhere comfortable and close at hand and going to sleep there. It appears to be additional evidence for the theory that the powerful mercury vapour lamp disrupts moths' navigation rather than actually 'attracting' them. The Swallowtailed was in particularly good condition and must have emerged from its chrysalis only recently. I had a job in Grasmere yesterday, lucky me, and stopped on the way back to check my notes at the Eagle and Child in Staveley. It has a very nice garden by the river Gowan and I ate my sandwich watching a heron organising its own lunch. How lucky am I, I thought, that I can hand over a piece of paper and in return get a delicious Cumberland ham and tomato bap, while the heron had to stalk about and stand like a statue for nearly half-an-hour before finally landing a wriggling fish. I'm afraid I didn't capture the actual strike, being both incompetent and quite a long way away (hence blurring, sorry), but here's the noble bird. The Eagle and Child? They shoud rename it the Heron and Me. The Flame (above) and the Flame Shoulder (below left) have come together to the trap, moths with a similar habit of tucking themselves away as tightly as possible in the nooks and crannies of the eggboxes. This prompts one of the very, very few lighter moments in my moth guide by Townsend, Waring and Lewington (British Wildlife Publishing). 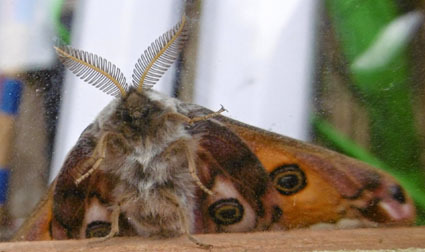 The authors remark of the Flame Shoulder: "It flies wildly and has an unfortunate habit of occasionally entering the ears of moth recorders near the light." 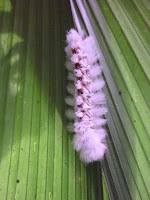 An ear must be tempting to insects which hunt out small tunnels and grooves. 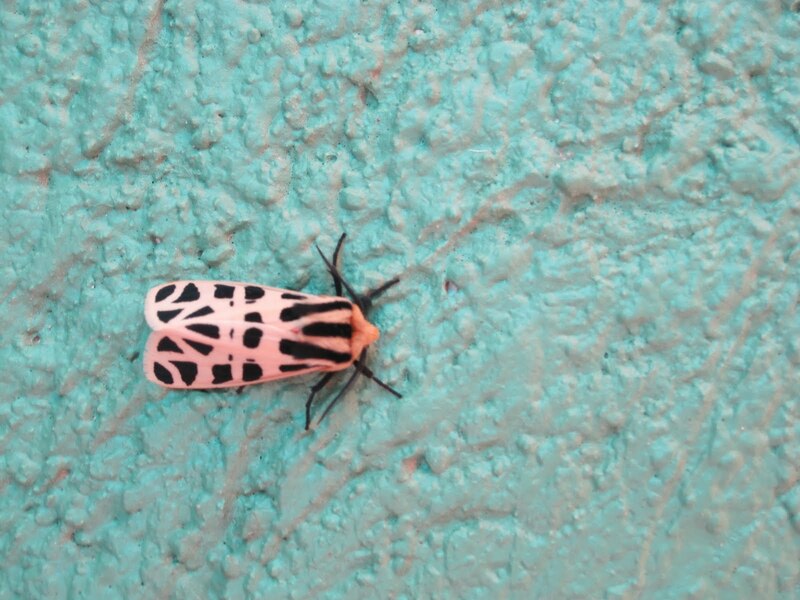 The Flame has one of the best camouflage outfits in the moth world. 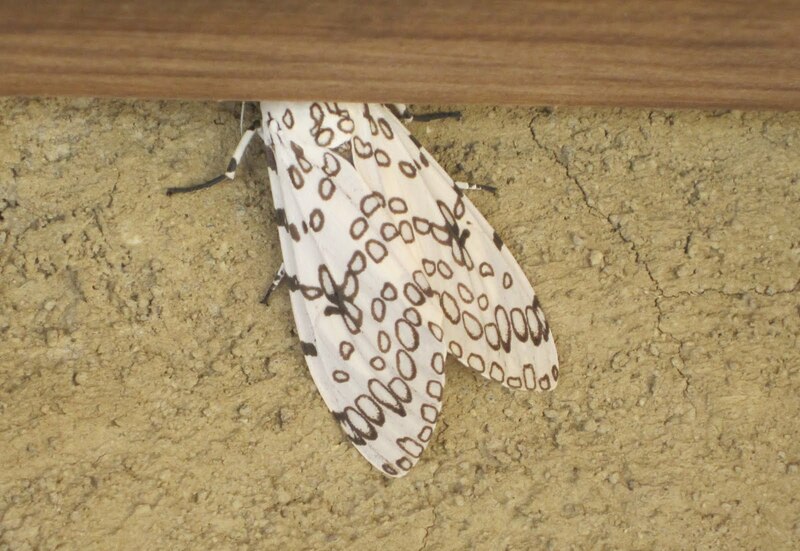 It folds its wings extremely tightly over its body and the pattern makes the result look exactly like a scrap of twig. It is also one of very few British moths whose width is greater at the head than the tail. The vast majority are the other way round, resembling small pyramids when at rest, with the wings fanning out to form the base. Colour in moths is one of a string of questions I've raised in this blog, but yet to find answers to. The almost complete absence of blue, my favourite colour, is the main niggle, but I'm also interested to know why green is not more common, given its obvious assistance in camouflage. Last night brought a feast of green, however, partly because I put the trap near some oak trees. On cue, a little army of Green Oak Rollers turned up - this little chap on the right. They are called 'rollers' because their caterpillars roll up oak leaves to make a small home which they then eat before spinning a cocoon in the remains. What a convenient arrangement. Along with them was this Green Pug (left), where the colouring is subtle and comes and goes with changes in the angle of light. Soon we should be getting the rather similar July Highflyer which is very varied but often has a basic but shifting ground-colour of green and grey. One day I hope to find a moth very similar to the Oak Roller apart from a white fringe which gives it the lovely name of Cream-bordered Green Pea, but it is much rarer. We've got persistent internet problems at the mo, which Virgin seems unable to sort out quickly, but I've made my way online now, and accompanying me is this Buff Arches. It's the kind of moth I like; you can't go wrong with its identification. Having said that, and having known it all my life since I first caught one on rum-and-treacle as a small boy, along with a Peach Blossom and a Burnished Brass which have stuck in my mind as its best friends (seasonally, they arrive together, so that makes sense), I'd never noticed one thing. It has the letter W written in beautiful scroll-like script on its forewings. That makes me like it even more. Look there, in the picture below where the wings are spread (through alarm at my photography). Rum and treacling, btw, is a very enjoyable way to spend an evening. You mix the ingredients, tasting regularly, and then smear on trees near scented flowers. When the moths arrive, they get drunk and/or stuck. It can be disappointing, mind. A light trap is about 100 times more efficient. Two fingers from a Snout moth here. They are palps, rather than fingers, but since these curious little instruments have all sorts of uses, both known and suspected and including 'feeling', the word 'fingers' is not perhaps completely inaccurate. There were two Snouts in the trap this morning, another indicator of the seasons' gradual passing. A Peach Blossom slumbered nearby along with two hawks, an Elephant and a Poplar, several Large Yellow Underwings, a tattered Peppered moth (in contrast to two almost-perfect ones yesterday) and lots of the small brown brethren. Among these was this trio, which look slightly different but are all Marbled Minors (at least I am pretty sure they are - except, see Ben's helpful comment, the one on the right is a Middle-barred Minor, new for me, though prob on grounds of my ignorance rather that its absence). I slid in the little wild geranium to add extra colour and interest. Cheating, eh. Time to make amends, a little, for my lamentations about 'small, brown moths' here in Britain compared with the treasures discovered by Tom, Abi and Rosie in Central America. It's not all dull here. This morning, in a moth trap busy with two hawk moths (Poplar and Lime) and a rich variety of Waves, Carpets and some 50 other arrivals, there were these two examples of bejewelled insects. The Burnished Brass, above, is perhaps the best of British moths for metallic sheen, created by the reflection (and, I think, refraction) of light from the wing scales. The Beautiful Golden (or possibly Silver, sorry if so - no it is Beautiful Golden, see Dean's helpful Comment) Y, left, is another example. I hope to get a visit this year, as previously, from the even finer Gold Spangle, which has a larger shiny flash on its wings, like the sort of thing General McChrystal might wear when he puts on his best uniform to meet French ministers etc. For a different, pallidly delicate form of beauty, here (below) is the Clouded Silver which also dropped in last night. It is another success story in the UK, having "increased dramatically" in Yorkshire since the 1970s according to Messrs Waring, Townsend and Lewington, authors of my ever-indispensable Field Guide to the Moths of Great Britain and Ireland (British Wildlife Publishing). I was painting the office door between Budget bullet-points yesterday, when this arrived. A first for our garden, it caught the sun as it jinked powerfully across the lawn and ended up on the top of my second tallest pea stick. I managed to grab the camera and will the insect to stay. Then I caught my foot on the base of the stick and off it went, flying up in a huge circle but then returning, as insects often seem to do, and perching instead on the tallest stick. Penny compared it to both a giant hover-fly and my grandfather's Royal Flying Corps SE5A biplane, which indeed it resembles, but I'm 99 percent sure, from the excellent website of the British Dragonfly Society (www.www.dragonflysoc.org.uk) that it is a female Broad-bellied Chaser. Welcome! Maybe she is the first fruit of our restored pond. btw do click on the pic to make it much bigger cos I'm very proud of my focussing. And that was hand-held, without the use of my trusty mini-tripod Miranda. Dragonflies have exciting names, such as the Northern Emerald and Vagrant Emperor, and the BDS website's sighting column is headed Hot News. But then they are exciting creatures in a much more obvious way than moths; witness Philip Pullman's brilliant use of them as steeds for His Dark Materials' fierce little Gallivespians - a good entomological coining, with 'vespa' the Latin for wasp (and Italian as well, hence the buzzy little scooter's name). I've filled in the sighting on the BDS website to add to their atlas of dragonfly distribution. The Chaser is described there as common and widespread in the South of England and Wales. Like quite a few of the moths I've trapped here, it seems to be wisely moving north. So, as per the conclusion to yesterday's post, why isn't anything vying with us for our crop of wild strawberries? Here (above) is a helping in all its glory, before Sunday lunch with the ceremonial pond-launching relations. These are small strawberries compared with the main, supermarket kind, but they've got pretty big and I'm baffled as to why our many birds, slugs and snails are not wolfing them down. The birds Hoover up our yew berries - poisonous to humans - so I don't think it can be anything to do with the colour red acting as a Darwinian warning. And here (left) is proof that occasionally the apparent taboo is broken. I wonder if that was a particularly persevering slug. I can see that the plants' very tangled and hairy undergrowth may be an effective defence against them and snails. 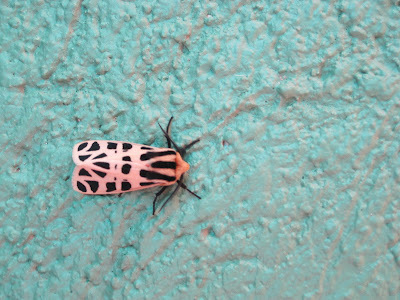 In moth-land, meanwhile, here's another excuse for my hopelessness with identification. These two (above) are both Dark Arches, in spite of their different colourways. The one on the right does at least have the distinction of being a 'form' or aberration with its own extra name of 'Aethiops' - cue Romeo's first impression of Juliet: "It seems she hangs upon the cheek of night, like a rich jewel in an Ethiop's ear. Beauty too rich for use..."
If any reader is courting, you might like to show your beloved this moth, compare her to it and stand well back. Two further examples of why I get in such a stew with all this brownery-greyery were also in the trap last night (the year's shortest-equal with the night before): a Grey Arches (just above) and a Dusky Brocade (right). Oh for the brighter joys of Costa Rica, where Rosie has been moth-spotting. Here (below) is another of her finds. And now to work, on Mr Osborne and the consequences of his budget. Midsummer Day! How lovely, and it really is lovely here and the forecast is lovely too. Joy as well for a selection of tadpoles (above) from our tiny pond which have been liberated in the bigger one - recently relined by the brilliant Creative Waterscenes of Bradford (www.creativewaterscenes.co.uk), as in the post several clicks below. We had a ceremony yesterday to carry out the transfer, with our in-laws and a cousin and her fiancee and our two grannies. Now we need more weed, so it's off to the Leeds-Liverpool canal. Meanwhile, this is turning temporarily into a Central American moth blog. 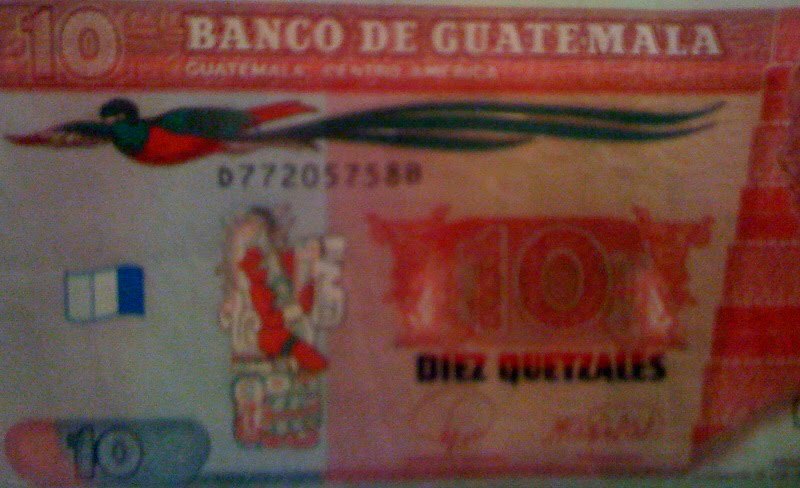 Following-up the very interesting Comments on the post immediately below, here is Tom's emailed picture of a Ten Quetzal banknote from Guatemala. 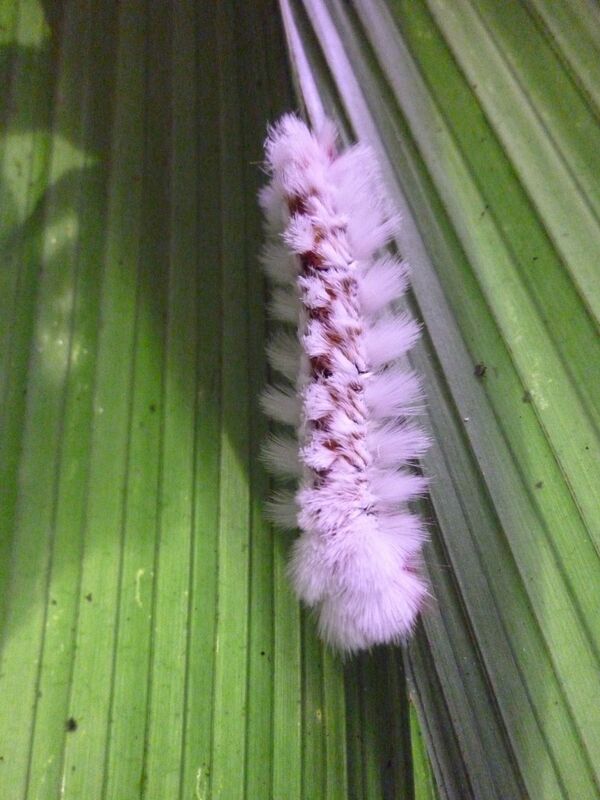 Meanwhile, one of my many lovely nieces, Rosie, who is also roaming Central America, has been inspired to send me some of her moth pics, including this outstanding creature, apparently fleeing from her below. It could be some sort of Starbucks logo for a moch-ed latte, but shhh, don't tell them, because that would spoil its beautiful innocence. Rosie is the sister of Jessie who sent those great pics from Borneo for the blog earlier this year. Don't they get around, young people these days? Tomorrow: why don't birds and slugs eat our wild strawberries? Sunny days, as Midsummer approaches, but the nights have gone cold and few moths are out celebrating in Leeds. Here's one who is, though, the Spectacle, with its uncanny patterning when you look at it head-on. Ah, what fate brought us to this dear but rainy little island, with its small brown birds and small brown moths? 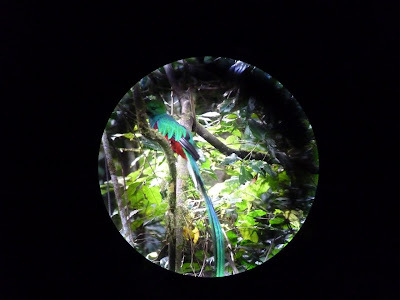 Mustn't be too glum, as previous posts show I hope, but just look what my son and his wife have found on a visit to Costa Rica from Mexico City, where Tom has the illustrious post on The Economist of Corresponsal en Jefe para México, Centroamérica y el Caribe. 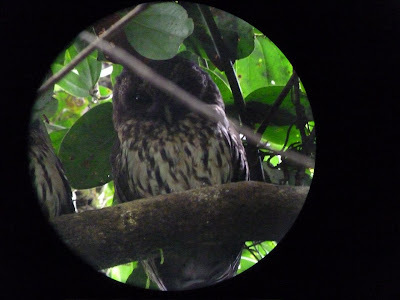 You can read his real work on http://wainwriting.blogspot.com (paste & copy - I'll add a link to my list shortly) but in the meantime, here are some of the treasures that he and Abi found in the forests. Thanks very much both - and if any foreign mothing correspondent knows what the caterpillars are going to turn into, we'd all be thrilled. 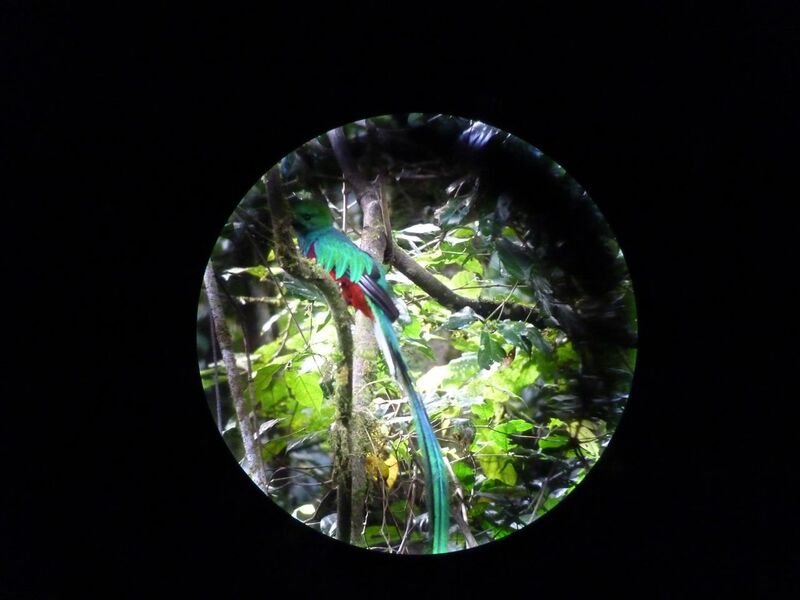 Some Costa Rican birds now. I love the owl staring back (the symbol of Leeds, btw, chosen in the mistaken belief that owls are wise), but the real glory is that unbelievable combination of primary colours, the famed quetzlcoatl. You can enlarge any of these pics by clicking on them. Whoops, sorry. See Comments. 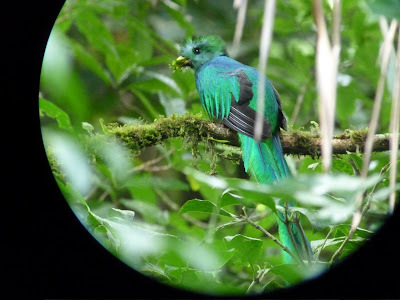 The bird is just a quetzel; the coatl bit belonged to a prehistoric creature a million years earlier (and a famed god, and the currency of Guatemala). Many thanks for the correction from Ornithon. Another regular took its seat at the moth bar last night. You could define the progress of the summer by each newcomer if you were sufficiently moth-minded. I don't think I would go that far, but English literature might be improved if the occasional knowledgeable reference to a seasonal moth joined all the stuff about flowers and nightingales. Take for example the very handsome Dark Arches, above, a clear sign that we are getting towards July. It doesn't seem very dark to me, but there already is a Light Arches which is undeniably lighter. After yesterday's rescue by Dean, I can at least salvage a bit of my tattered reputation by saying that this next trio are also Ingrailed Clays and 'proper' ones at that, in that (unlike yesterday's) they do resemble Richard Lewington's brilliant paintings in my guide. I have to admit that I coaxed them into this grouping which, to continue the pub metaphor, they resemble Ena Sharples, Minnie Caldwell and Martha Longhurst in Coronation Street of old. Or to change tack, is there something here of waiting for a bus for ages and then three come at once? Finally, I will hazard a guess at the customer, left, and plump for Common Rustic (or Lesser Common Rustic, only distinguishable by examination of their genitalia which is an indignity too far in my opinion. On the other hand, it may be some sort of Dart, a tribe which could appear in virtually any chapter of novels set between April and October, so impressive is their breeding and longevity. The Peach Blossom has made its first appearance (left above), a lovely moth with a pattern whose distinction is balm to inadequates like me who find moth identification a constant trial. Below at the left and bottom are two examples. They look distinctive enough, especially the orange one. But it does not tally exactly with anything I've examined so far in Richard Lewington's marvellous illustrations in my Field Guide to the Moths of Great Britain and Ireland (British Wildlife Publishing), my moth Bible. No doubt it is a Common Quaker or some such, because variation in the patterns is very common. I will persist. Last night seemed set for a good catch, so warm that we had supper outside, but in the event there was a fairly modest tally: about 40 moths, including a fine Peppered, the Herald which accompanies the Peach Blossom in a blurry way above, several Shoulder Flames, Hebrew Characters, Carpets and a Pebble Hook-tip. I think we are in one of those lulls between major hatching. Please may it stay warm. Later: Hooray for Dean, whose excellent blog you must visit on http://deansdailydiary.blogspot.com/. I will add it to my list when I remember how. He describes himself online as 'a man of few words', but his vital words in this instance are that the delicate creamy moth is a Riband Wave and the orange one an Ingrailed Clay (see Comments). Thanks very much indeed. Lawn-mowing continues intermittently, between Guardian jobs. This actually comes to you from Pizza Express in Newcastle where I am covering the weird and wonderful case of the jewellery-laden North East oddball who is accused of stealing a rare Shakespeare First Folio from Durham Cathedral. 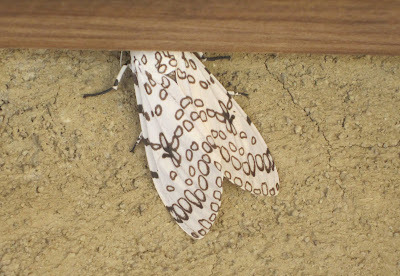 Anyway, I was discoursing in previous posts about the number of moths which are out and about during the day in June, when days cover most of the 24-hour cycle in the UK and night-time is very brief. Lo and behold! As I emptied my Flymo yesterday, what should I find but the season's very first Yellow Underwing, a miraculous survivor of the machine's whirling blade. Here it is, inside the grass collecting box, recovering from its ordeal. Regular readers will know that yellow underwings try my patience by their overwhelming numbers, so calls for restraint in mowing would cut little ice here, I fear. If it ever comes to a showdown between a neat English sward and the yellow underwing, I am a lawnista every time. 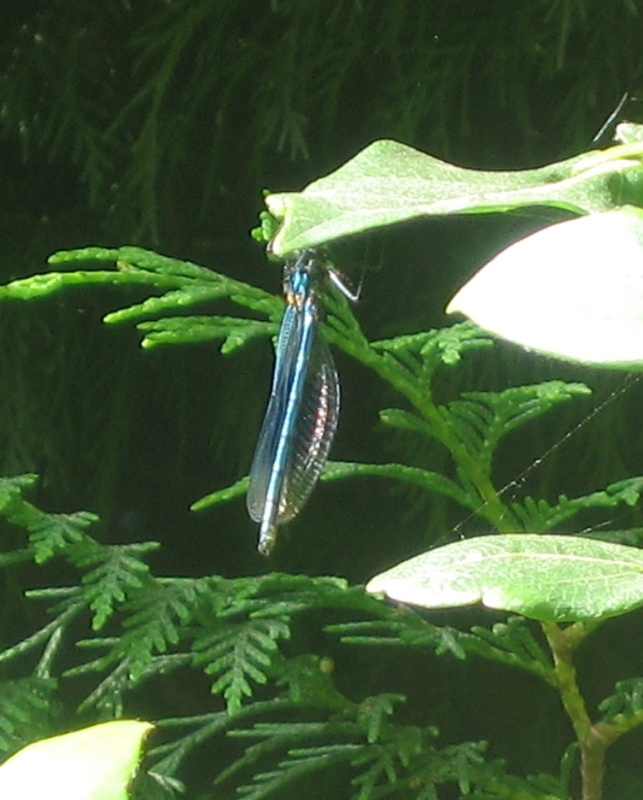 A good omen yesterday, with the damsel fly. Now here's another. I thought a hairstreak was visiting the garden when I saw a small, dark insect fluttering about on the clover covering our disgracefully unkempt lawn. We had a White-letter Hairstreak two years ago and there are Green Hairstreaks on Otley Chevin not far away. I'd like to see one again. But no, this is a Chimney Sweeper, an intriguing little moth which likes flying in the day. That's unusual for moths, but the Sweeper takes the habit a step further. It particularly likes bright sunshine, which we have also been enjoying, at last. Sweeps bring luck, allegedly. I met one in Leeds who reckoned to earn almost as much from appearing at weddings as he did from cleaning flues. You can see why the moth is named after them, sooty black apart those two delicate trims of white on its forewings. I wonder why they are there. I also wonder if more moths are tempted out by day at this time of the year when the nights are so short. I saw several Carpets fluttering about yesterday afternoon and a Silver Y jitterbugged off when - prompted by the Chimney Sweeper - I at last mowed the lawn. After more than a year of havering, we've had our leaky old pond renewed (by a really, really good firm in Bradford called Creative Waterscenes. We'd have done it ourselves, enjoyably though nothing like so well, but age and fears that we'd bungle the liner kept putting us off. Simon and Brian of CW were nice and interesting people to have around and, fittingly, their completion of the work yesterday was celebrated by the arrival of our first damsel fly of 2010. Here it is (above): sorry a bit blurred but it decided to perch high up, beyond my reach. Shortly afterwards I was pottering about in some long grass and disturbed this Straw Dot - shown in the big picture with its antennae out and in the smaller one with them in, but with its little snout showing. Actually the 'snout' is the moth's palps, strange invertebrate organs which seem to combine the work of mouth, nose and radar. The moth should really be called Straw Dots, as you can see. Like some people, it initially appears drab and boring but is anything but. Creative Waterscenes is on www.creativewaterscenes.co.uk and Penny and I wholeheartedly recommend them. They're keeping busy in spite of the recession, I'm glad to say. Good that a small firm from Bradford is looking after 200 ponds as well as making new ones all the time. The amount of extra wildlife which comes to a garden from a pond can hardly be overstated. We've just had a great weekend at a family reunion in Stow-on-the-Wold youth hostel, which must have seen some of its most venerable 'youth' in residence for many years. A lot of B&Bs and pub rooms were involved too, but it wasn't our (genuinely) young relations beating a drum and blowing home-made World Cup trumpets on the late side in the market square on Saturday night. Had I known the level of good-natured local tolerance, I might have taken the moth trap and illuminated the Cotswolds with its glow. As it is, I'm making do with these woollen butterflies which appeared on lots of local benches, lamp-posts, wrists etc as part of Worldwide Knit in Public Day. I had never heard of this, but it was celebrated enthusiastically in Stow on Saturday, much as used to happen in the Yorkshire Dales where the cottage industry was so vigorous in the 18th century that people spoke in awe of 'the terrible knitters of Dent.' They meant terrible in terms of energy, rather than any lapse in knit-one, purl-one. 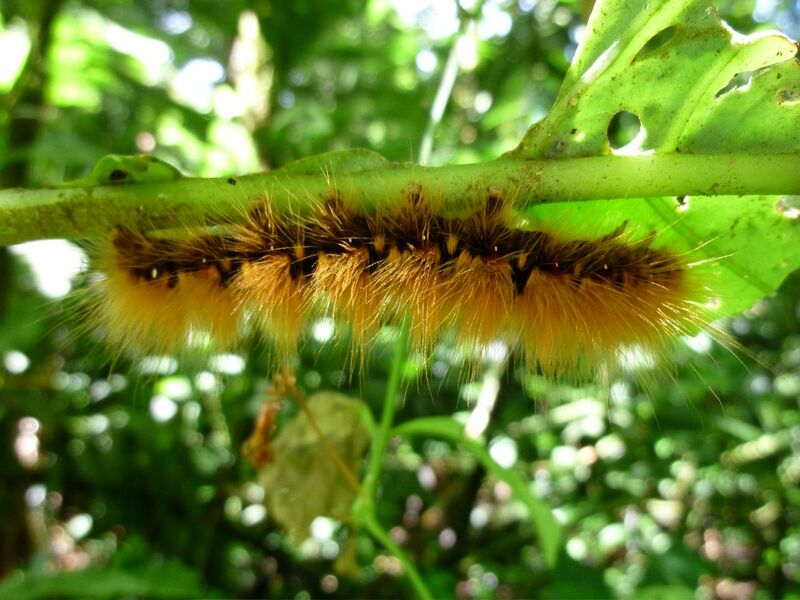 Back in Leeds on Sunday evening it was pouring with rain, but my son and daughter-in-law in Mexico cheered me up by showing me some exotic caterpillars on Skype. I approached the trap this morning without my usual optimism. It had been a cold night, albeit dry at last, and I had put the light in a shady bit of woodland for a change. But as often happens, low expectations were rewarded: slumbering away on an eggbox was the third of the handsome hawk moths which I've recorded on my Leeds list. This is the Lime Hawk, saying Good Morning above, and in its full glory below. I haven't passed my entomological enthusiasm particularly to my sons, though both are what you might call 'moth aware' (not surprisingly...) but one of them made a celebrated discovery. He spotted a Lime Hawk in broad daylight on a wall in Walton Road at Jericho in Oxford, where Philip Pullman had the inspiration for the canal gypsies who rescue Lyra, the heroine of His Dark Materials. The Lime Hawk has been used as an object lesson for camouflage designers; it could have been kitted out by the Ministry of Defence. It is also another species which is spreading North in the UK, and it's excellent to know that all is well with its outpost here.